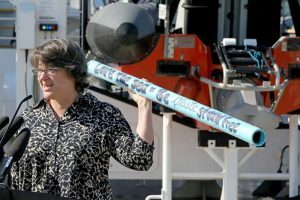 Seattle became the first major U.S. city to ban plastic straws and utensils — including forks, spoons, knives, and cocktail picks — this week. The city passed a law 10 years ago requiring that all single-use food-service items, such as to-go containers and cups, be compostable or recyclable. But straws and utensils were exempt from the law because there were not many compostable or recyclable options at the time. Currently about 500 million straws are trashed each day. They commonly end up blowing out of landfills into waterways, and ultimately end up in oceans, where they hurt wildlife. Strawless Ocean estimates that 71 percent of seabirds and 30 percent of turtles have some kind of plastic in their stomachs, which cuts their lifespan in half. Starting July 1, grocery stores, restaurants, food trucks, and cafeterias will have to serve customers straight from the cup or provide compostable plastic or paper straws. Failure to comply may result in a $250 fine. In September, 150 businesses participated in Strawless in Seattle, an attempt to reduce the use of plastic straws. 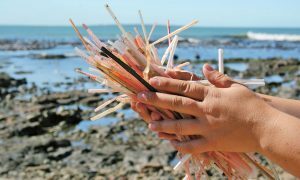 In that month alone, Strawless Ocean estimates, 2.3 million plastic straws were removed from the city. The move has influenced Seattle-based Starbucks to develop strawless lids for all of its stores nationwide.